Hey everybody! I just had a really, really busy weekend! 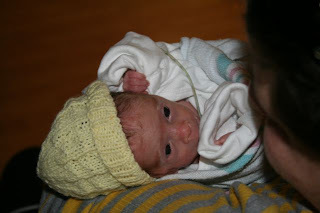 Not only did I turn six weeks old on Friday, and cross three and a half pounds too, but I had a whole bunch of visitors! Now that the weather around here is a little bit better, all sorts of people are coming to see me. In addition to Mommy and Daddy, and Aunt Debra and Uncle Jason, my Uncle Eli came down from Boston, and I got to meet him for the first time on Saturday. Then, on Sunday, Mommom and Poppop came with Mommy, and I also got to meet both Mommy's friend Beth, and my cousins Gail and Sylvan. I just love having visitors here! 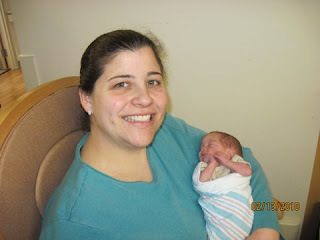 In other exciting developments, Mom Mom held me today, and Daddy gave me my bottle. 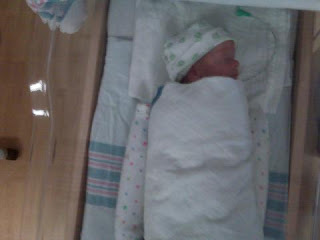 Mommy and Daddy are at home tonight, putting together my Pack-and-Play and car seat. I can't wait to be home- hopefully it'll just be a couple more weeks. Anyway, here's a video Daddy shot of me today, just before feeding time. As you can tell, I was very hungry! All right, time for bed. 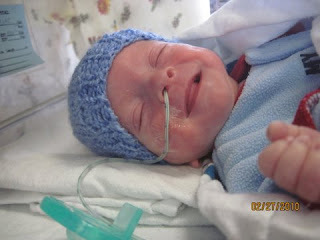 Thanks to everyone for asking about me- I'm doing great! Hey everybody! I'm having another good week. 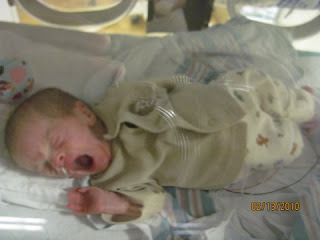 The big news is that on Monday they finally put me in my own crib! It's nice to be at room temperature, and it's also easier for Mommy and Daddy to reach me without having to open the glass. Otherwise, I'm getting bigger, slowly but surely. 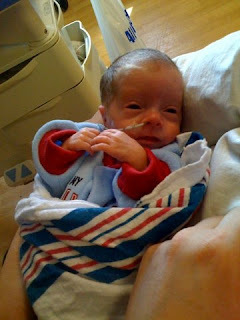 As of Wednesday morning I weigh 3 pounds, 5.1 ounces, which is up from 2 pounds when I was born, almost six weeks ago. 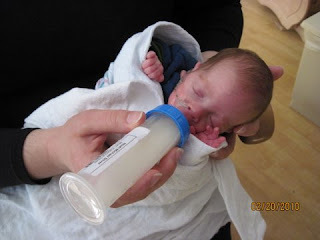 They keep upping my feedings, and I'm now drinking from the bottle 3-4 times per day. The rest of the time, I'm still sleeping a lot! Anyway, the other exciting thing is that Mommy's friends threw her a surprise baby shower on Sunday. 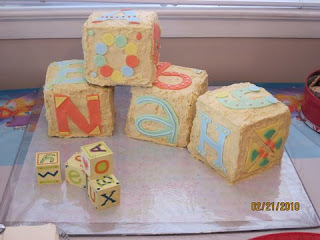 Not only did they give her lots of great stuff for me, but Aunt Jaime made a cake with my name on it! Mommy really appreciates it, and so do I! Have a good rest of the week everyone. 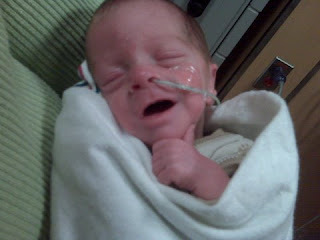 I'm still in the NICU, but can't wait to come home, hopefully very soon. 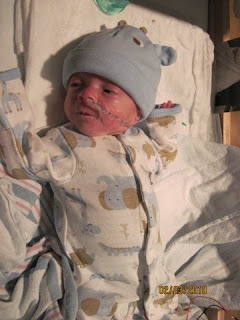 Thanks again for all the well wishes! Hey everybody! I'm having another great week. 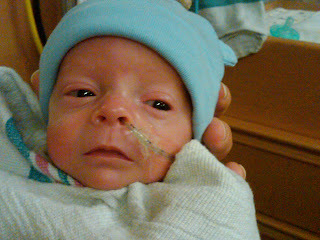 I'm growing more and more every day- up to 3 lb 2.8 oz as of Saturday morning- and on Friday I drank from a bottle for the first time. 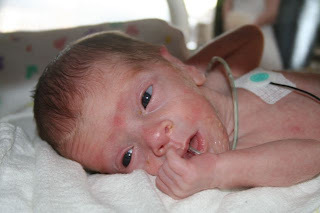 Mommy and Daddy have been visiting every day and holding me during feeding time, which is always very nice. 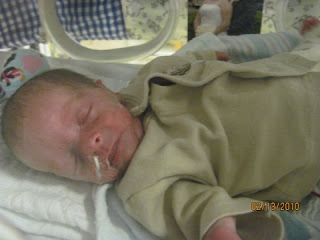 They've also got me in all the awesome outfits people have been giving me. Thanks so much! Anyway, time to go back to sleep. But it'll be time to get up and eat again very soon. Thank you all so much for the well wishes- I'll be home before you know it! PS- Thanks for reading the blog- I read it too! Hey everybody! 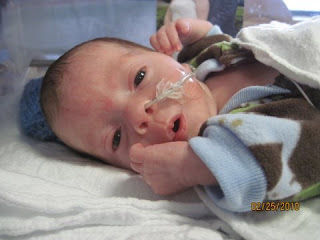 Well, Monday was a big day, because I turned one month old! Thanks so much for the well wishes in my first month- and to think- just 11 months until my first birthday! 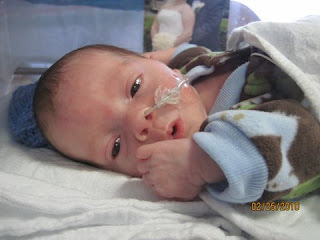 And speaking of growing, I am also coming up on three pounds- that's right, I've grown by 50 percent in just one month! 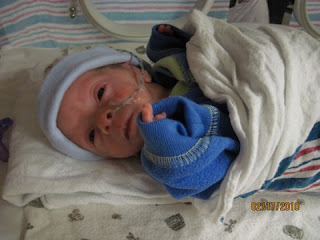 One other big development- they moved me on Sunday over to the Transitional section of the NICU. Not only do Mommy and Daddy not have as far to walk as far down the hall to see me, but I'm now just one step closer to coming home. It'll be a few more weeks, but I can't wait. I met two more relatives for the first time this weekend, Aunt Ruthie and Cousin Rachel, who came down from Boston just to see me on Sunday. I can't wait to see them and the rest of the family when we go up there this summer. 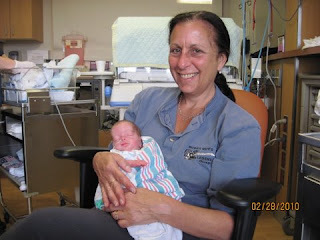 I also got to see Mommom, Poppop and Aunt Debra this weekend, in addition to Mommy and Daddy. Anyway, I'm starting to get tired, so back to napping. Have a good rest of the week, and thanks so much for everyone who's been asking about me. Hey everyone! It's been quite an eventful few days. First, as you may have noticed from the pictures above, I'm now wearing clothes! It's kind of nice, I can stay comfortable, and also wear some of the awesome outfits people have been giving me! 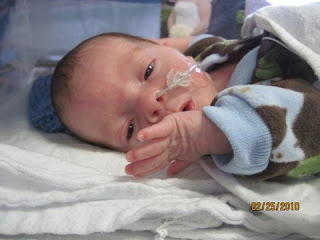 I turn four weeks old tomorrow, and I'll be a month old on Monday. 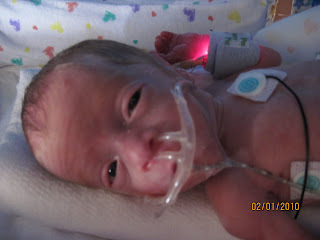 Hard to believe how big I'm getting- I now weigh 2 pounds, 12.7 ounces! 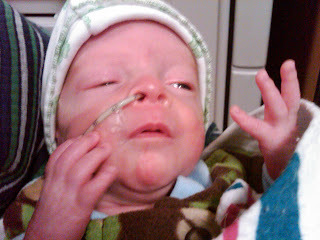 And they also moved my feeding tube from my mouth to my nose, so I can start eating. Because of the snow Mommy and Daddy weren't able to make it to see me yesterday, but they both came today and I got to spend some quality time with them. Anyway, have a happy Valentine's Day everyone. Bye! Hey everybody! Hope everyone on the East Coast is successfully digging themselves out of the snow. 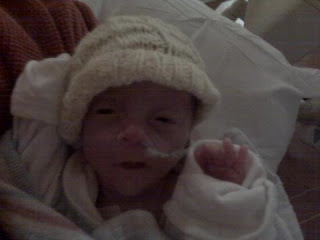 Luckily, there's no snow here in the NICU, and I've been warm and dry all weekend. I know I'm going to spend a lot of time in snow in my life, but it's good to stay out of it this time. I'm doing pretty well. 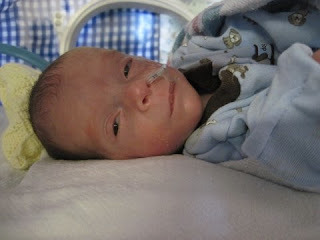 I turned three weeks old on Friday, and it's so hard to believe I've been here almost a month. 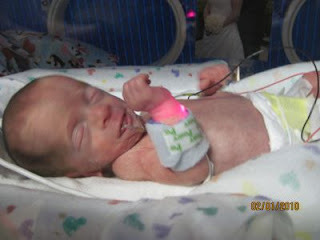 I'm also growing more and more every day- I'm finally over two and a half pounds! And after they put my cannula tube back in last week, I finally got it out again today- I'm breathing room air once again! My grandparents are in from Minnesota this weekend, it's so great to see them both! 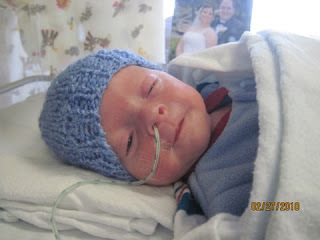 Unfortunately, Aunt Amy and Jason had to reschedule due to the snow, but I hope to get the chance to meet them very soon. I'm also excited for Mommom and Poppop to come back from their vacation on Monday. Anyway, back to napping- and as you can see below, thumbsucking. 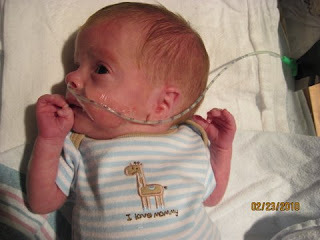 Enjoy the Super Bowl everyone- I can't wait to be home to watch it with Mommy and Daddy next year! 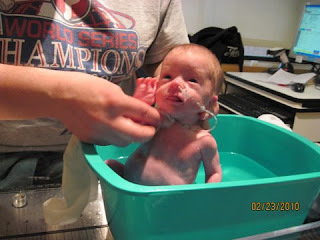 Look Ma- No More Tube! Hey everybody! Big day, today, for two reasons. 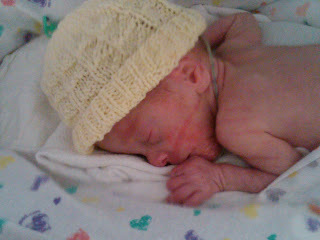 First, I gained 16 grams between yesterday and today- my biggest one-day gain ever- and am now up to 2 lb 3.7 oz.! 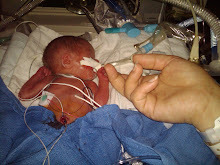 Still pretty tiny, but I'm getting bigger all the time. 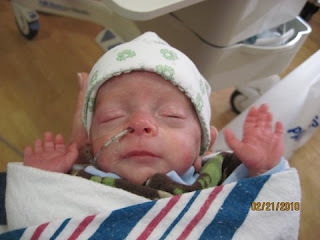 Then, when Mommy was here, I pulled out my cannula tube, and I was doing so well that they kept it out! 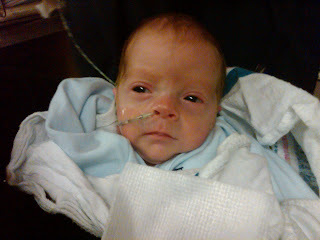 The nurses say I may need it back again at some point, but in the meantime, it's so nice to be breathing on my own. I've also had all kinds of visitors lately! Mommom and Poppop come by all the time, and Aunt Debra and Uncle Jason came to visit on Sunday, and Aunt Hannah did on Monday. Mommom said she and Poppop are going on vacation to Jamaica this week- I sure will miss them! 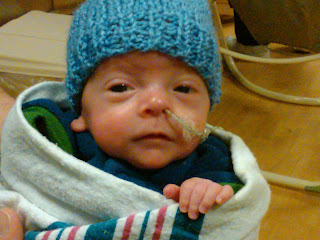 Anyway, they said it snowed outside this weekend- but luckily, I'm still warm and toasty up in the NICU. All right, back to napping!